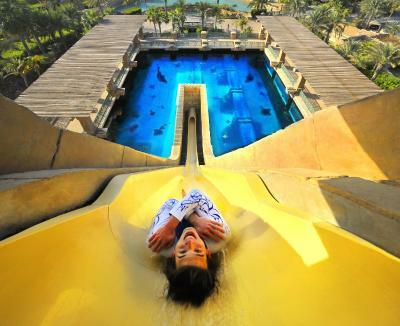 Lock in a great price for Atlantis The Palm, Dubai – rated 8.6 by recent guests! Breakfast had a good choice of food and beverages, including Champagne. Ease of access to the resort facilities. Staff were great with children, particularly our baby. everything was great they upgraded us because they got our room wrong the first time. 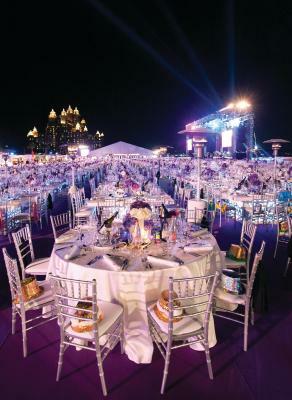 The location, facilities, restaurants, entertainment. The whole resort is amazing. So many things to do. Also included the waterpark and Aquariam, a great weekend break - would highly reccomend. 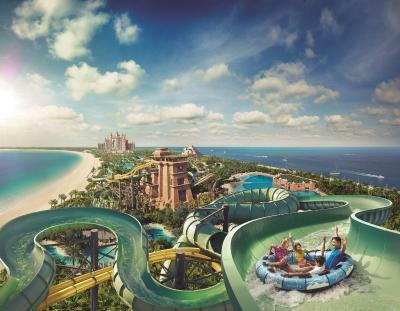 Atlantis The Palm, Dubai This rating is a reflection of how the property compares to the industry standard when it comes to price, facilities and services available. It's based on a self-evaluation by the property. Use this rating to help choose your stay! 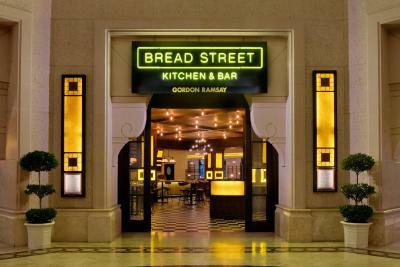 One of our best sellers in Dubai! 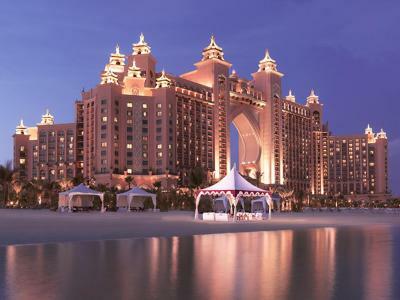 Located on Dubai’s Palm Jumeirah Island and enjoys a private sandy beach, the 5-star Atlantis offers stunning views of the Arabian Gulf. 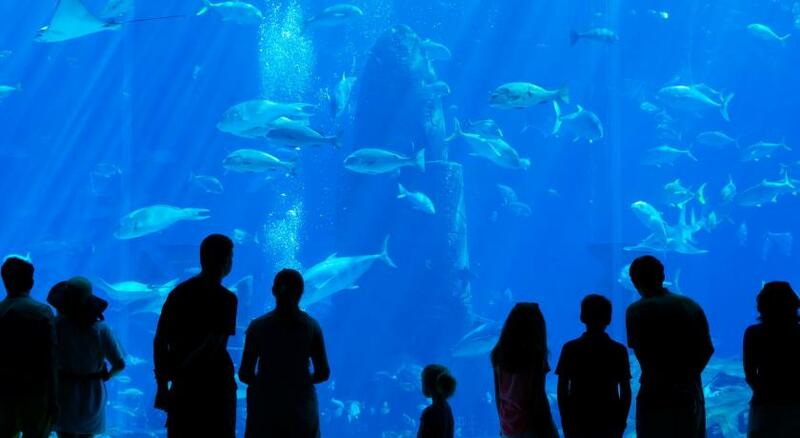 It provides an underwater aquarium, swimming with dolphins opportunities and complimentary access to the Aquaventure water park and the Lost Chambers Aquarium. Free WiFi is available throughout the entire property. 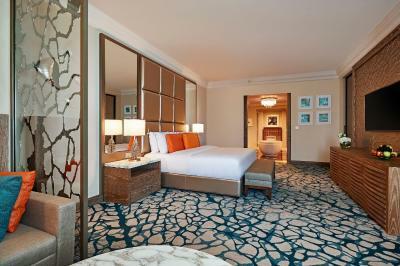 All the Arabian and oceanic décor inspired rooms feature a balcony with scenic views. 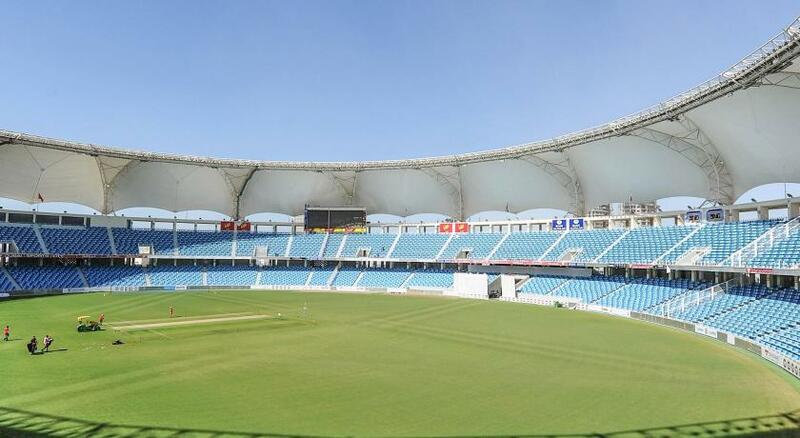 They include a flat-screen satellite TV, a seating area, complimentary tea/coffee making facilities and a mini bar. Some rooms include a stunning large terrace with panoramic views of the palm or an over sized spa bath located in the center of the bathroom. 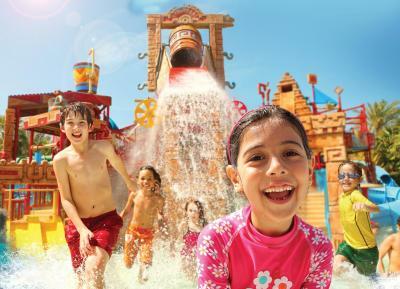 Guests enjoy complimentary access to Aquaventure, the largest waterpark in the Middle East, features the Tower of Neptune and the Tower of Poseidon packed with thrilling water slides. A water playground for younger guests is available. 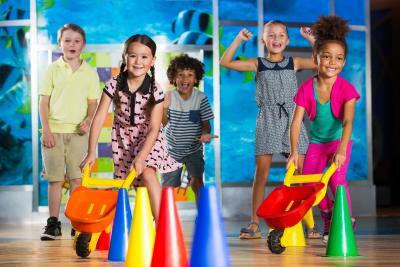 The Kids Club provides the best fully supervised entertainment for your children and with daily programs. The Zone offers teens a chance to hangout, dance and play the latest video games. 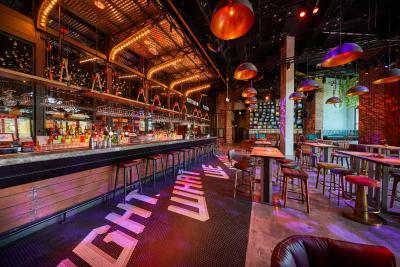 Wavehouse offers both dining and entertainment in one area where guests can enjoy good food and drinks, a play area for children and adults, a four lane bowling alley, a state of the art wave machine and more. 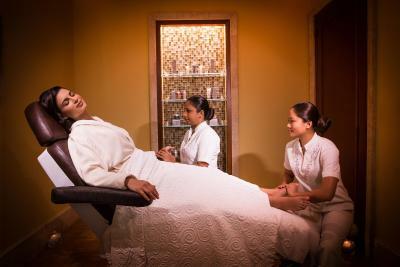 Guests can enjoy facial and body treatments at the ShuiQi Spa. 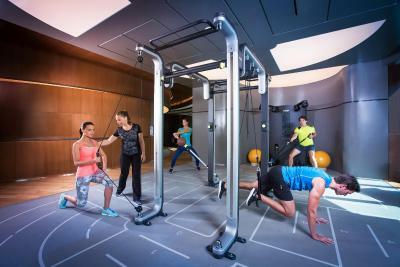 The gym provides personal fitness coaches. 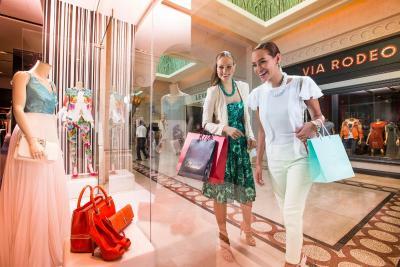 The property offers a range of some of the world’s finest high end boutiques and shops that cater for all of your holiday essentials. Guests have the opportunity to book a helicopter ride for a 15 minute tour around Dubai or for Airport transportation. 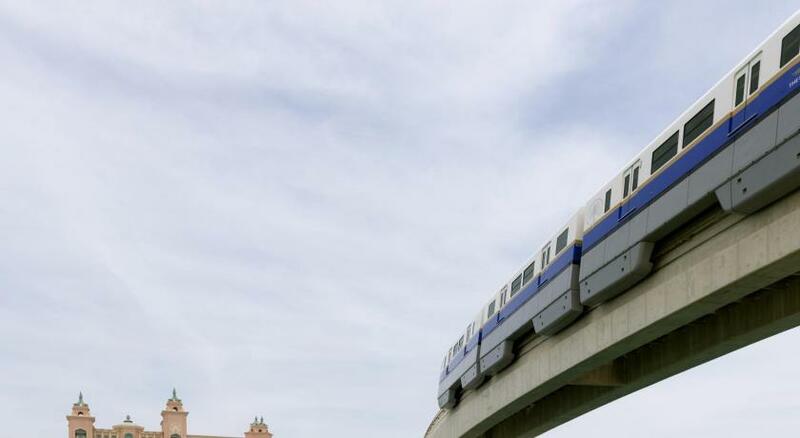 Mall of the Emirates can be reached in 20 minutes by car. The Emirates Golf Club is 1.9 mi away. 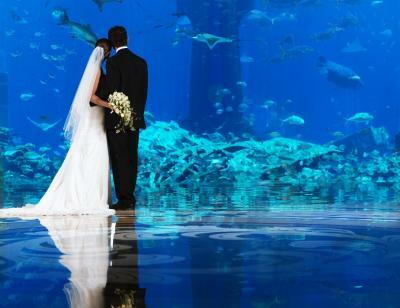 The iconic Burj Khalifa and The Dubai Mall are a 25-minute drive from the Atlantis. 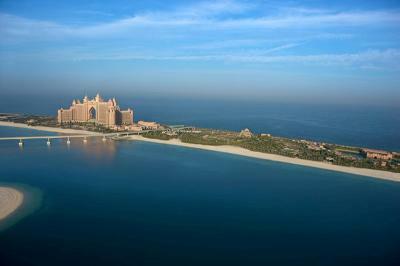 When would you like to stay at Atlantis The Palm, Dubai? Inspired by an Arabesque design, this Executive Suite Club features a balcony which provides a view to the sea or Dubai skyline. It includes a spacious living room with a flat-screen TV, sliding wooden doors, a 4-seater dining table and a large work desk. The bedroom features a walk-in closet, a powder room and a king sized bed. The relaxing bathroom offers a his and her separate walk-in shower, a large spa bath, bathrobes, ESPA® toiletries and slippers. •Complimentary roundtrip airport transfers from Dubai International Airport. Contact the hotel in advance to confirm transportation. 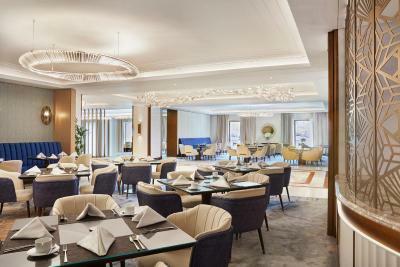 Inspired by an Arabesque design, this Terrace Suite Club features a large terrace which provides 2 sunbeds and a 4-seater dining table overlooking sea or Dubai skyline. It includes a spacious living room with a flat-screen TV, sliding wooden doors and a work desk. The bedroom features a walk-in closet and a king sized bed. The relaxing bathroom offers a his and her separate walk-in shower, a large spa bath, bathrobes, ESPA® toiletries and slippers. Feel royal in the Regal Club Suite which captures the classical Arabian theme in all corners of the suite and overlooks the beautiful sea or Dubai skyline. It includes a large work desk with a leather seat, a 6-seater dining table, a spacious living room with a flat-screen TV and a large balcony with 2 sunbeds. The bedroom offers a seating area, a walk-in closet and a king size bed. The bathroom features a his and her separate walk-in shower, ESPA® toiletries and a large spa bath placed in the middle of the bathroom. Inspired by the ancient ruins of the mythical lost city, this triplex underwater suite features a private elevator that connects the entrance foyer area to the luxurious living room which offers floor-to-ceiling windows into the Ambassador Lagoon. It also includes a 6-seater dining area and a 60" flat-screen TV. The spiral staircase would lead you into the underwater bedroom which offers a unique ambiance with direct views of the underwater world. Experience a cozy Arabian themed living area in the Majlis that includes a flat-screen TV. 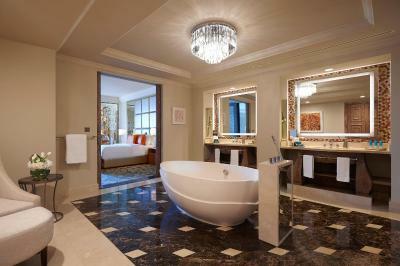 Relax in the en-suite spa bath that overlooks the home of 65,000 marine animals while enjoying LARIC® luxury amenities. Inspired by an Arabesque design, this Terrace Family Suite features 2 interconnecting rooms, a large terrace which provides 2 sunbeds and a 4-seater dining table overlooking the sea or Dubai Skyline. It includes a spacious living room with a flat-screen TV, sliding wooden doors and a work desk. The bedroom features a walk-in closet and a king sized bed. The relaxing bathroom offers a his and her separate walk-in shower, a large spa bath, bathrobes, ESPA® toiletries and slippers. 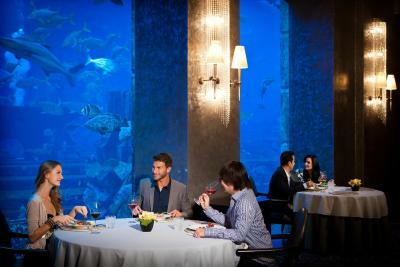 •Complimentary access to Aquaventure Waterpark & The Lost Chambers Aquarium. Inspired by an Arabesque design, this Executive Family Suite features two-interconnecting rooms and a balcony which provides a sea or Dubai skyline view. It includes a spacious living room with a flat-screen TV, sliding wooden doors, a 4-seater dining table and a large work desk. The bedroom features a walk-in closet, a powder room and a king sized bed. The relaxing bathroom offers a his and her separate walk-in shower, a large spa bath, bathrobes, ESPA® toiletries and slippers. Feel royal in the Regal Club Suite which captures the classical Arabian theme in all corners of the suite and overlooks the beautiful sea or Dubai skyline. It includes a large work desk with a leather seat, a 6-seater dining table, a spacious living room with a flat-screen TV and a large balcony with 2 sunbeds. It features 2 interconnecting rooms offering a seating area, a walk-in closet and a king size bed. The bathroom features a his and her separate walk-in shower, ESPA® toiletries and a large spa bath placed in the middle of the bathroom. Inspired by the treasures of the Arabian ocean, this 220 square yard air-conditioned bright suite provides an ideal balance between elegance, privacy and comfort. 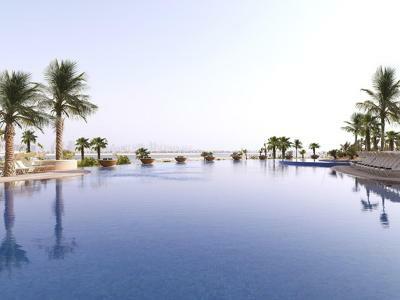 It features a large balcony with spectacular panoramic views of the beautiful Atlantis beachfront and Dubai skyline. 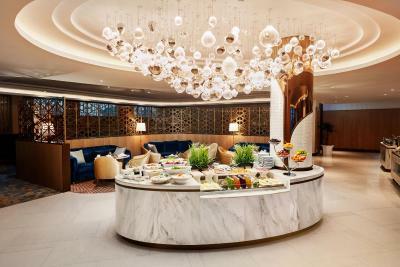 There is a large separate living room with a 60" flat-screen TV, built in Bose® speakers, crystal chandeliers, free WiFi, an 8-seater marble dining table and an adjacent luxurious office. The kitchen is fully equipped with a stove top, a dishwasher and a refrigerator. The elegant his and hers bathrooms are fitted with an oversize spa bath, 2 separate rain showers and complimentary LARIC® amenities. • Complimentary roundtrip airport transfers from Dubai International Airport. Contact the hotel in advance to confirm transportation. Inspired by the exotic treasures of the sea, the Grand Atlantis Suite captures the true meaning of luxury from every room in this palatial 429 square yard accommodations. It features no less than 5 balconies as well as an enormous sun terrace which spans three sides of the suite offering a dazzling sensational 270 degree view. 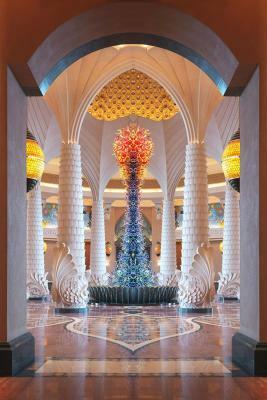 It features 3 entrances with large dragon fish statue fountains and tailored high ceilings. 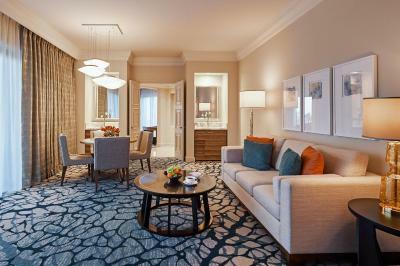 The generous living room space offers a 60" flat-screen TV, an adjacent luxurious office and an 8-seater dining table. The kitchen is fully equipped with a stove top, dishwasher and a refrigerator. Both bedrooms are beautifully designed for the most exquisite experience, with 4 walk-in closets, a powder room and a seating area. Relax in the stunning bathrooms which overlook the beautiful blue ocean. They each include a rain shower, an over-sized spa bath and LARIC® luxury amenities. This spectacular, private, exclusive and truly unique 924 square yard Royal Bridge Suite really captures the true meaning of royalty and elegance. 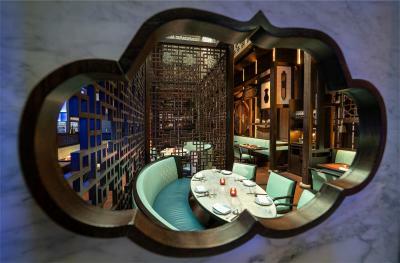 It has its own guarded entrance and elevator along with a dedicated team of people from butlers to chefs on hand. 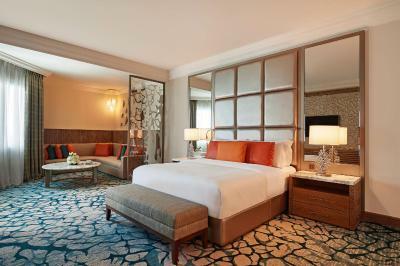 The décor is exquisite and will sweep you off your feet, with its floor-to-ceiling windows and over-sized living spaces. Chose between the 2 large terraces to enjoy a 360 degree view of the Arabian Sea, the glittering Dubai Skyline or a complimentary massage. 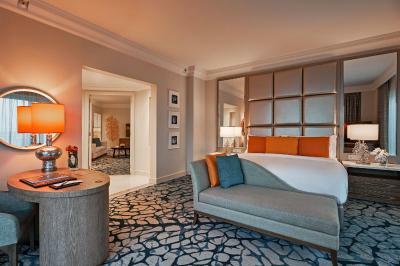 Each bedroom is expertly designed, blending Arabic elegance with contemporary luxury. All 3 bedrooms in the Royal Bridge Suite are equipped with private bathrooms with centrally located bathtubs and separate showers. The master suite goes one step further by offering separate his and hers private bathrooms. 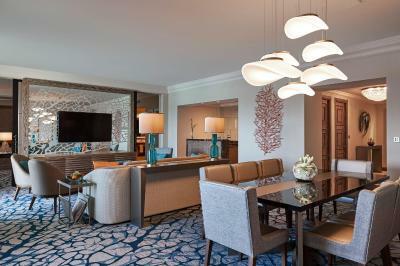 Bask in the luxury of 24-hour in-room dining with a table that seats 16. When you stay in the Royal Bridge Suite you can be assured that everybody’s needs are exceeded, with your own private library, billiard table, media center, majlis and massage room. 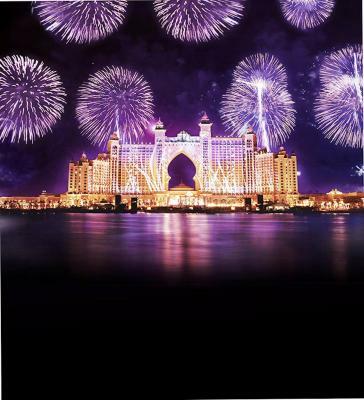 Guests staying at the hotel on December 31, 2019 will be charged a Mandatory New Year’s Eve Gala Dinner fee, not included in the room rate.The fee is AED 3,200 for adults (21 years and above), AED 2,240 for guests 12 – 20 years old and free for guests 11 years old and below. One child between 4 – 11 years old can go for free with one paying adult. Every additional child is charged 50% of the adult price, For more details and other Gala Dinner options, please contact the property directly. Please note that this is a UAE resident rate, it is mandatory to present a valid UAE ID or residency proof upon check-in. Guests staying in the Ocean King Room will enjoy unlimited complimentary access to Aquaventure Waterpark and The Lost Chambers Aquarium, as well as preferential rates at Dolphin Bay. 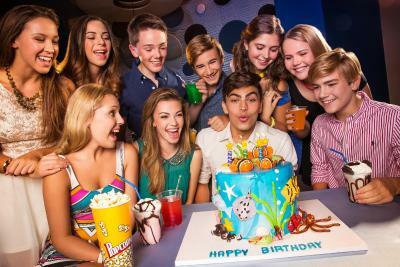 In addition there will be 1 free complimentary afternoon session at Kids Club or The Zone for younger guests. Guests staying in the Ocean Queen Room will enjoy unlimited complimentary access to Aquaventure Waterpark and The Lost Chambers Aquarium, as well as preferential rates at Dolphin Bay. 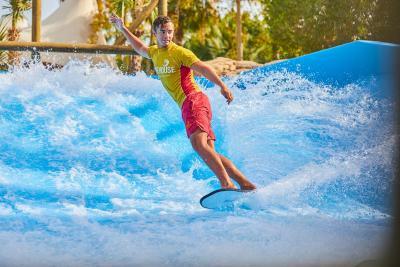 In addition there will be 1 free complimentary afternoon session at Kids Club or The Zone for younger guests. 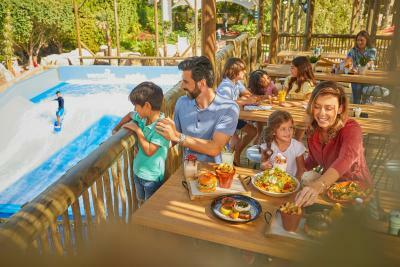 Guests staying in the Palm King Room will enjoy unlimited complimentary access to Aquaventure Waterpark and The Lost Chambers Aquarium, as well as preferential rates at Dolphin Bay. In addition there will be 1 free complimentary afternoon session at Kids Club or The Zone for younger guests. Guests staying in the Palm Queen Room will enjoy unlimited complimentary access to Aquaventure Waterpark and The Lost Chambers Aquarium, as well as preferential rates at Dolphin Bay. In addition there will be 1 free complimentary afternoon session at Kids Club or The Zone for younger guests. 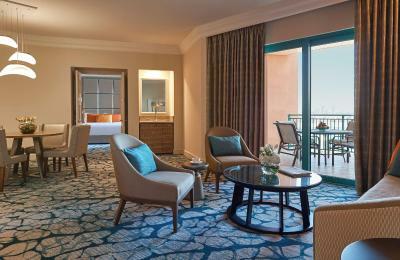 Guests staying in the Imperial Club King Room will enjoy exclusive benefits worth over 3,000 AED a day, including return airport transfers from Dubai International Airport and access to the Imperial Club Lounge, as well as unlimited complimentary access to Aquaventure Waterpark and The Lost Chambers Aquarium. 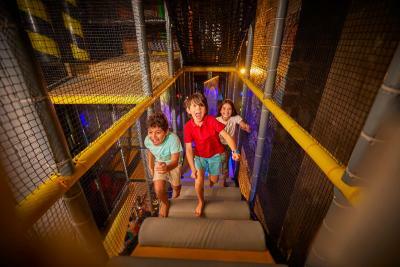 In addition there will be 1 free complimentary afternoon session at Kids Club or The Zone for younger guests. 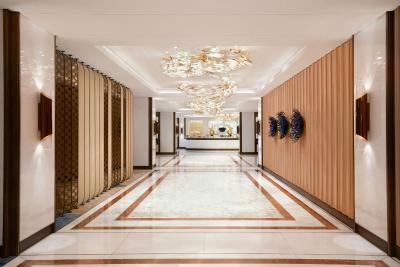 Unwind at the Imperial Club private beach or at ShuiQi Spa with 2 treatments for the price of one. Guests staying at the hotel on December 31, 2019 will be charged a Mandatory New Year’s Eve Gala Dinner fee, not included in the room rate. 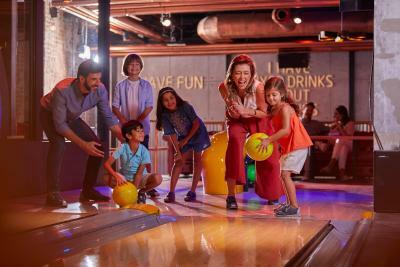 The fee is AED 3,200 for adults (21 years and above), AED 2,240 for guests 12 – 20 years old and free for guests 11 years old and below. One child between 4 – 11 years old can go for free with one paying adult. Every additional child is charged 50% of the adult price, For more details and other Gala Dinner options, please contact the property directly.